CUSCO - CACHORA - Chiquisqa The bus will pick us up at the hotel at 6 :00hrs to begin our journey to the village of Cachora. During our journey we will stop a moment to observe the archaeological remains of Tarawasi from the bus, continuing thereafter towards the Cunyac Bridge between the departments of Cusco and Apurimac. Next we will travel through the district of Curawasi and Saywite Stone, arriving at Cachora at 10:00 hrs. approximately. We will begin our trek from this area, along sloping path leading to the pass of Capuliyoc (2800 m.a.s.l) where we will stop for lunch after a two-hour walk. Then we will continue our journey to the town of Chaquisqa (1930 m.a.s.l). The whole course to Chaquisqa is downward and the landscape is awesome and the weather is warm. Our first camp will be setup here. This is a three-hour walk. Chiquisca-PLAYA ROSALINA-Sunchupata After breakfast (05:00 hrs), we will continue our walk towards Playa Rosalina (1550 m.a.s.l), followed by an early climb up the hill towards Santa Rosa (2100 m.a.s.l) where we stop for lunch. This course is the hardest and we will take three hours after which we will climb up to the Maranpata (2850 m.a.s.l) that is an easier climb. During our journey we will observe the vegetation existing in the area. Later, we will journey along a straight section towards Sunchupata where will camp. Trekking time is two hours. 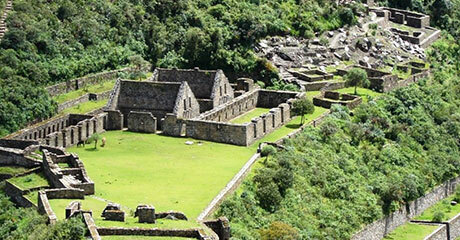 It is a one hour journey from this spot to Choquequirao. Sunchupata - Choquequirao - Chiquisqa Very early and after breakfast (05:00 hrs) we travel towards Choquequirao, which is a one-hour walk to see the sunrise at Choquequirao and where we will remain for three hours in the company of a guide who will provide you with all the details about this important Inca refuge. At the scheduled time, we will begin our return to Sunchupata, descending to Santa Rosa, where we stop for lunch. Thereafter we continue descending to Playa Rosalina that takes about an hour. Upon our arrival at Rosalina we will continue our journey to the village of Chaquisqa, two hours away from Rosalina, where we will spend the night. Chiquisqa - Capuliyoc - CACHORA A hearty breakfast shall be served in Chaquisqa (06:00 hrs) after which we will return along the same route to Cachora which is the slope we descended on the first day and which is a smoother climb of two hours until we reach the pass of Capuliyoc. From here, it takes another two hours to reach the village of Cachora along a smoother route, arriving at 12:00 hrs approximately. During our journey we will observe the exotic flora and fauna as well as sights of majestic snowcapped peaks and the impressive canyon of the Apurimac. In the afternoon we will travel to the medicinal thermal baths of Qonoq where we will remain for one hour and continue later on our journey to the city of Cusco. You will be transferred to the hotel. End of the services. Payment of 50% of the tour.